We just had the great honour of being announced as the Australian winner of the 2008 Imagine Cup and will be flying to France in July to compete in the world finals (visit http://imaginecup.com/ for more details). This is a fantastic award to have won so I thought I would take the time to explain and give an overview of what SOAK is and the vision we have for its future development. These sensors provide SOAK with the relevant real time information that is needed for the more advanced functionality. An automated watering system allows for a very fine level of control over when to water. The weather forecasting is taken into consideration when calculating if now is the best time to water the crop. If rain is predicted to fall in the next 48hours, the system can hold back from water so as to reduce the water consumption of the farm. 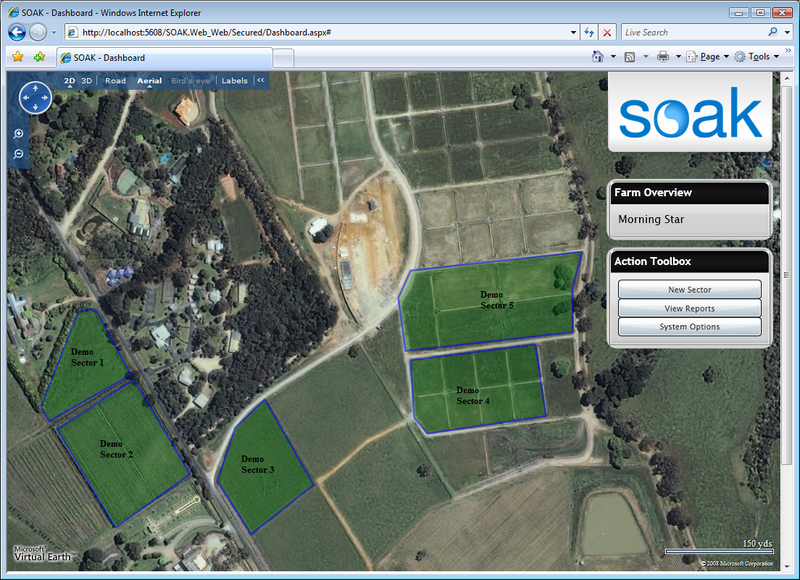 Currently SOAK has implemented 3 delivery mechanisms each targeted to a specific use and data consumption. 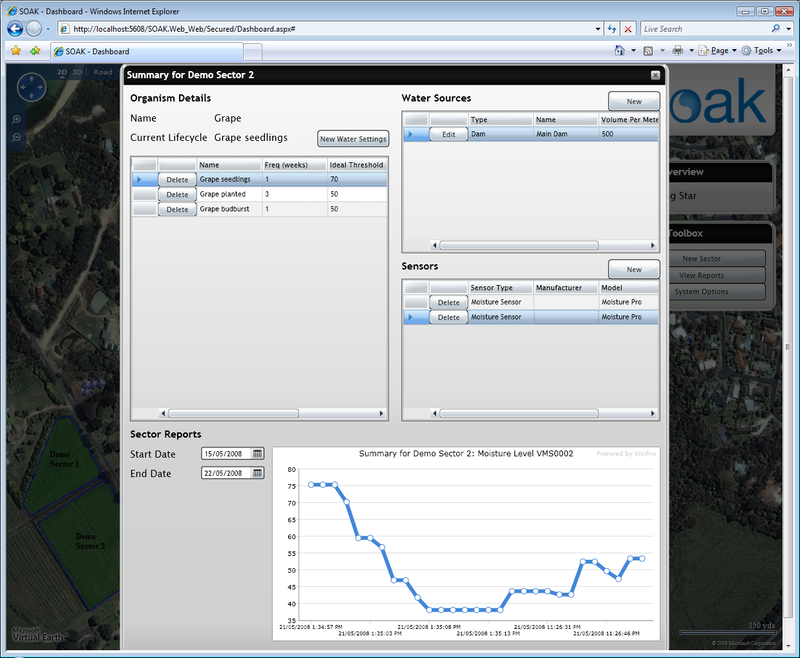 The Silverlight web application is the main access point for SOAK. 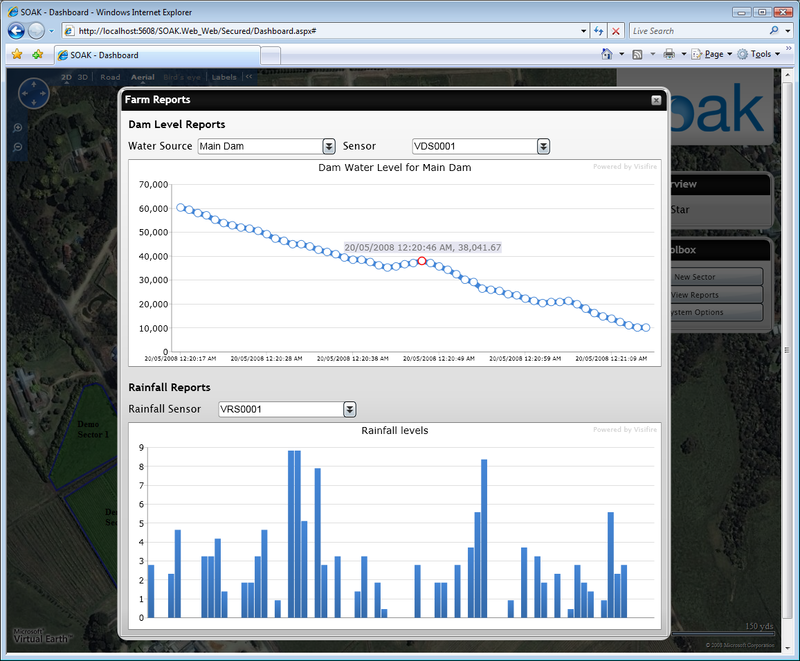 Here we present very detailed and visual information tailored to management users. This was created as a mashup between Microsoft Virtual Earth and Silverlight 2.0 Beta1. The Windows Vista Sidebar gadget provides data at a glance with the most important statistics about the areas they are concerned with. 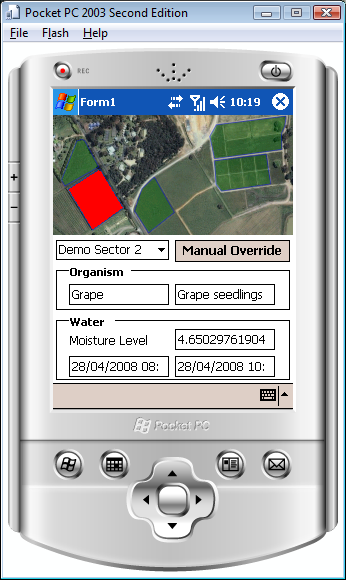 The PDA application provides field operators with real-time summary information about the areas they are visiting and gives them access to a manual over-ride of the sprinkler system when out in the field. If you would like to contact me for further information about SOAK, please leave your details. On Friday 30th March there will be a launch event for the new Microsoft Windows Vista and Office 2007 showcasing the new features and capabilities of the 2 products. Windows media centre, the new Aero interface and sidebar gadgets in Vista. New ways to visualise data in excel, creating “smart art”, the new user interface and applying themes to entire documents in Office. 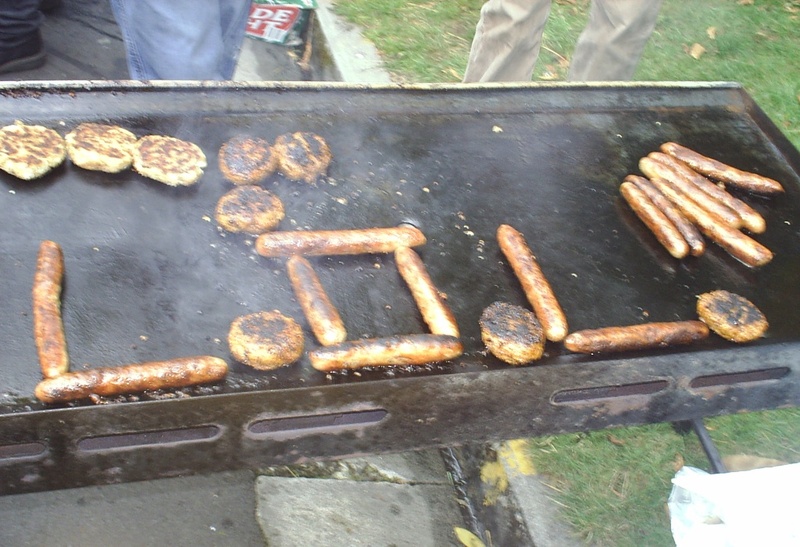 The 28th of Feburary was Societies day at the University of Tasmania. 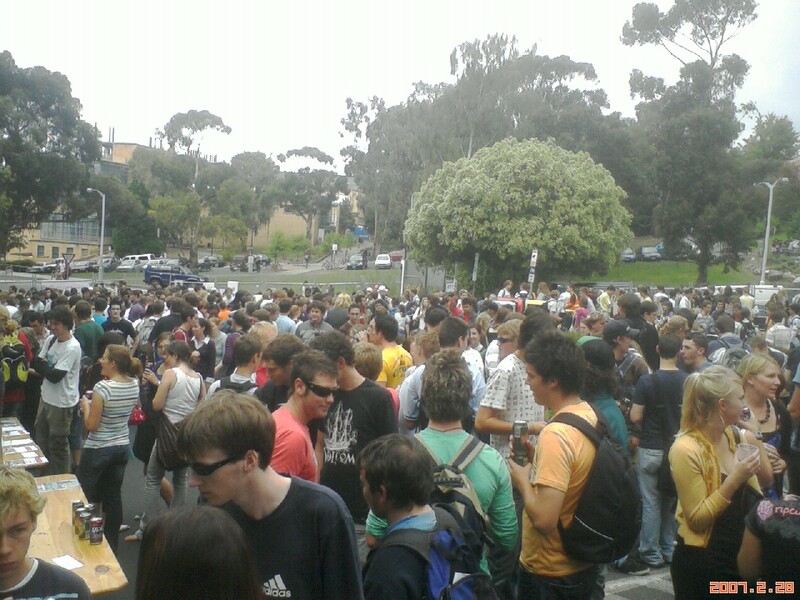 It is a chance for all the different student societies to setup a stall and encourage students to signup to their society by offering ‘incentives’ (Usually in the form of alcohol).